We know, we know…you’ve heard enough about the Victoria’s Secret runway show! 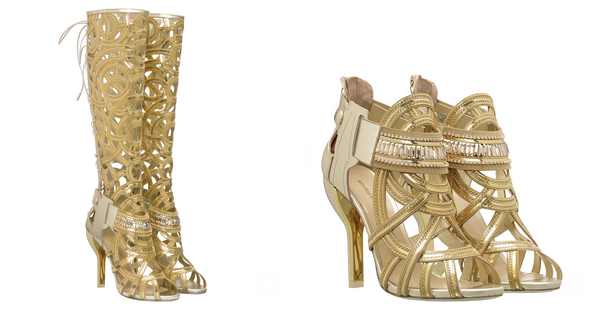 But did you hear about those gold Nicholas Kirkwood heels? Kirkwood specially designed two pairs of shoes for this season’s “hero”-themed portion of the famous lingerie show (which remind us of this ’80s superhero icon). Karlie Kloss wore the “Gabo Angel” knee-high Kirkwoods on her mile-long gams, which will set you back a whopping $16K. So we had to ask Kirkwood: What’s the secret behind these pricy chaussures? How long have you been creating shoes for the Victoria’s Secret show? I’ve worked with the team for three years now. What kind of direction did they give you this year for the shoes you designed? The VS team designs the different sections in the show with the chosen theme, and we start working on the shoes when themes are quite well-defined. Sometimes we design for specific looks and sometimes for a whole group, which might share the same style. The bootie is $4,900, and the tall boot is available b y custom order for $16,750. The hand-embroidered gold chain and the dozens of Swarovski crystals take a skilled artisan many hours to meticulously apply! The press release describes these as “hero” shoes for the Gabo Angels. Did you have a superhero in mind when designing? You could say that to many, the Angels are seen as superheroes themselves! How did you feel the first time they asked you to do it? It was exciting: it was a different brand direction, and a challenge to design pieces that embodied the spirit of the different characters in each of the runway’s stories. Did you attend the show in London? Yes, I did. There really isn’t anything like it! It was amazing to have that energy in London. Which Victoria’s Secret model do you love to watch walk the catwalk? They all have really different and unique personalities that are amplified in the shows. Karlie [Kloss] and Taylor [Swift] had a lot of fun during the performance; the crowd loved it!